What you always wanted to know about balloon decorations you'll (hopefully) find here - or you ask a question and I will answer it as best as I can. Click here to - Ask one, Answer one or Rate one! Click here to - See what other visitors have asked! This is an interactive page, i.e. YOU can answer a question too, as you might know an alternative solution or simply have more experience in a certain area than I have. Perhaps you have a great tip on how to make a color matching base. Or you've found a special technique to apply hi-float for best results. We'd love to hear about it. This way, you save yourself and others the trouble of asking the same question on balloon decorating issues, or you become my co-expert on balloon decorations by rating and submitting comments. When you ask me a question or submit a tip, I will build your own page exclusively for your balloon decorations issue. You can add more questions or let visitors add comments and ratings at the 'Visitor Comments' below the page, and I will always be there to answer them and help you. Question: I am interested in getting into balloon decorating - have you got any ideas or tips on how to do this? Answer: Yes, we sure have a few tips. Is there enough demand in my area? How much time and money can I invest to get started? 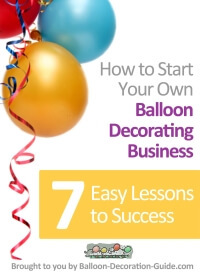 My eCourse "How to Start Your Own Balloon Decorating Business - 7 Easy Lessons to Success" guides you through those questions. I don't want to brag, but you won't find a business building course, tailored to the needs of balloon decorators, anywhere else on the Net. Well, certainly not for US$ 27. So, sign up now and get started! If you are planning to advertise your services with a website, then I can highly recommend the website and online business builder I use myself. It comes with all the tools and a proven process to build a profitable service selling business online. To ramp you up on the decorating side, you could get the Qualatex Balloon Network (QBN) Training Kits. Not only will you learn all the techniques to create professional looking balloon decorations, but you'll also get valuable tips for running a successful business. Additionally, if you take the tests, you can display the "Certified Balloon Artist" (CBA) logo on your web site or marketing brochures. If the cost of $249 for the Qualatex Training Kits is too high for you right now, you can enroll in a relatively new video course "Easy to Learn Basic Balloon Decorating for Parties & Events," offered at a learning platform called Udemy for $49. Tip: Watch for Udemy's special offers, where you may get the course for just $10 or $15. Question: How do you make a double balloon, that is blow up a small balloon in a large balloon? Answer: You slip the small balloon over a chop stick, which makes it much easier to insert it into the big balloon. Make sure that the necks of the two balloons are aligned before you withdraw the chop stick. Now inflate the outer balloon first and then the inner balloon. The trickiest bit is to knot both necks at the same time without losing too much air or helium. As an easy alternative you could use a small food bag clip to seal the balloon necks. Question: How do I create a balloon centerpiece, i.e. with 2 clusters of 4 with a latex 9 inch heart coming out of the middle? Answer: The first thing you need is a balloon base. We feature some examples for balloon bases here. A centerpiece with two clusters of four with a latex heart on top is similar to our "Valentine Balloon Bouquet". If you follow the basic process outlined there, but with two layers of 4 balloons instead of one layer with 3 balloons, you should do fine. Question: What is the easiest way to use tulle instead of curling ribbon? Answer: For balloon bouquets you should not use solely tulle to attach the balloons to the base as the tulle will get stretched out and won't look nice after a while. The best way is to use curling ribbon to attach the balloons and then disguise the ribbon with tulle. Question: Where can I get a column base from? Answer: You can either buy a ready made one from a specialist balloon supplier or you can make one yourself, as we explain on our site. The materials for the self-made balloon column base can be found at a hardware store or at an electrical supplier (the conduit). Question: What are the dimensions to make the Base for a 14'-16' column? Answer: I would suggest you use steel base plates (custom cut - from a machine shop for example) as a base for those tall columns - they are heavier than the plywood ones that we describe on our web site. The downside of steel base plates is that you need to weld the flanges onto the center. Alternatively you could use strong nylon cord (aka parachute cord) to strap your plywood square base to the top of a same size square concrete stepping stone from the hardware store. That should make the base heavy enough to support your 14 to 16' column. If the column is just for a short event (one evening) you could also fill the balloons with helium - then they will support themselves, more or less. Of course this makes it more expensive and the balloons won't hold the helium as long as they will hold air. Question: Can I have directions for building my own columns sent to my email address? Answer: We haven't got round to turn our website in an e-book so far, although we'd like to do that. So the best thing I can recommend is to print out the respective pages from our site and take them with you to the venue. Hot Air Balloon Model - Make Your Own! Question: Where do we purchase the supplies for the Hot Air Balloon Model? Answer: You can get all supplies for the Hot Air Balloon model at Amazon. The 36 inch latex balloon is made by Qualatex (the renowned producer of highest quality helium balloons) and comes in a variety of colors. The fitting balloon nets are sold separately. Question: I am interested in this balloon service, where do you operate? Answer: We are delighted that you are interested in our balloon decoration service. However, we don't offer our decorating services at the moment, due to relocation and starting a new job. I am sorry that we can't help you with your request. You could do a search at the BallonHQ Directory. They have a list of balloon artists and decorators worldwide. You can specify your search by country, state, city, by category or even by name, if you are looking for a certain company. Or you can search our own international directory of balloon professionals. Question: Which company is the best wholesaler to buy all balloons? Answer: As we are not living in the UK, we can't really comment on the best wholesaler there from own experience. A reliable source with high quality products surely is Qualatex / Pioneer. As a business you can order their catalog for free. You can also search for qualified distributors and balloon professionals in the USA, Europe and other countries who sell balloons in bulk to retailers. These select distributors are members of the Qualatex Balloon Network (QBN) distributor program. Question: Where do I find information about balloon sculpturing / decorating classes? Answer: Please check out the BalloonHQ Calendar or search for classes at Qualatex. Both feature a regularly updated calendar of various educational courses in the United States. Haven't found the answer to your question in my FAQ list? Then here's the place where you can ask your question, add a comment or share your answer to one of the issues with your fellow balloon decorators. Simply fill in the form below. You can even upload a photo to illustrate your problem or solution. Your question / tip will appear on a Web page exactly the way you enter it here. You can wrap a word in square brackets to make it appear bold. For example [my story] would show as my story on the Web page containing your story. Please note: The maximum image size accepted is 800x600 pixel. Click on the links below to see some great questions and/or tips about balloon decorating. They were all submitted by other visitors of this page. How do I get 100 balloons to stay in place hanging over the dance floor? How far in advance can I build a balloon column? How can I make a balloon stiletto? Where can I by large size boxing glove mylar balloons? Will a helium filled balloon wrapped in tulle float? Ideal size for single round balloon centerpieces? How much tulle do you need to cover a 17" latex balloon? How to fix a lollipop balloon on a stick? Balloon Centerpiece - What is the spiral type thing? How do I hang balloons upside down in clusters at my reception? Where can I get the net for this type of balloon arch? How do you set up for a balloon drop? Does any of your readers know where i can buy a reasonably priced balloon stuffing machine? What is the shelf life on latex balloon and mylar balloons? I am planning a party and was wondering if I can purchase balloons 6 months before I even use them? Is it best to use Latex helium columns outside? If so, how do you make them without a pole? Also, what is the anchor for 9 feet with 36 inches on top? Thanks for your tips. What brand of balloons do you recommend when decorating an event? Besides Qualatex, are there any other balloons you would recommend using when decorating an event? How can I make a balloon drop for a wedding and is there a way of releasing them? How to make a balloon arch with one-side-printed smileys but all smileys should be easily seen? How can I write Happy Birthday on a Balloon? Balloon Arch: How many people, and time allowed? How long do you allow, time wise, to make an arch eight feet tall? 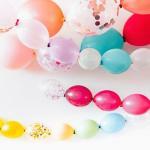 Do balloons and flowers go together at a reception party? Just wanted to know if it will look right because I'm getting married and I like both of them ... balloons and flowers. I am looking for acrylic tubes to make balloon topiaries as centerpices. Looking for 24inch high and about 3/4inch thickness or a clear plastic. I'm not sure how to make the netting for a hot air balloon center piece. Can you tell me how to do this and what to use? Thank you. Where to purchase different sized balloons?? What is the way of hanging balloon designs? Can I use plaster? Because am afraid it will burst. Thank You. Where can i find balloon decorating instruction catalogs? how to calculate a spiral arch? How do I figure out the approximate number of balloons to make a spiral arch? I want to make the bride and groom from helium balloons and would like to find instructions on how to complete the task. Can you do very large string of pearls? How many clusters of 4 balloons can fit on a 10ft length arch? Where can I buy these yo-yo type balloons? Can you recommend a good training dvd for balloon decoration? I am starting up a Party balloon business and need a good dvd with plenty of ideas. How do I make the netting for hot air balloon centerpieces? How do I use HI FLOAT? How can I "set" marker on a latex balloon? How can I make balloons hang heavy from the ceiling? ¿What materials do I need to create a wall mural with balloons? What weight in grams would I have to use to hold 3 party size helium balloons down? I have made some balloon weights from material and sweets. Now I am not sure if they will be heavy enough to hold my helium filled balloons? Is it o.k. to inflate 14 inch balloons to just 9 inches? Is there an easy way to tie a balloon? Is there some gizmo that facilitates tieing a balloon? I want to inflate about 100 balloons to give out during a celebration. How can I prevent my stuffed latex balloon from becoming cloudy? They appear to be okay at first, then become more cloudy looking even when kept away from sun and heat. How do you make a Shooting Star Column? I need help on how to make a shooting star balloon column. Curly Balloons - Where can I buy them? 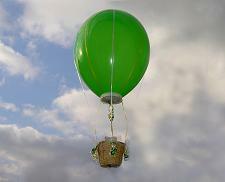 5inch Balloons for "Balloon Babies"
Where can I order nice boxes to deliver balloon bouquets? I've tried everywhere! I can't find some nice dotted ones or coloured. I'm starting my business and I really need those boxes. How do you make a star shape balloon arch? I would like to know the dimensions to making an arch in shape of a star. A walk through arch. But I'm not sure of the sizes or the materials. How can I make a table decoration using balloon sticks ? What are the best suggestions for mounting balloons onto walls and ceilings? Balloon arch to last 3 days? If I need my balloon arch and columns to last 3 days, do you recommend I use Hi-Float and helium? It is an indoor event. How to do a foil balloon arch? Balloon sizes in a square-packed garland? What is a good electric air inflator?? Line for Balloon Arches with Spaces Marked on it? What weight of Monofilament line do I need to make a helium filled balloon arch about 50 ft long? How long do air filled Link-o-Loon Balloons stay up? We are interested in making a star arch out of pvc pipe for a dance - what is the best way to do it, or should we use a different material? I am doing a friends party on Saturday and would love to know how would I make a number 50 in balloons. 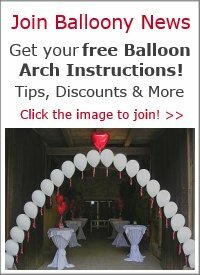 What are the step-by-step instructions to making a link-o-loon arch, like the one that is displayed on this website? In what specific shops can I find column base AND arch frame in SINGAPORE? Where can I buy column base AND arch frame in SINGAPORE? I need it ASAP. I need to know specific names of shops because I'm new here. I've tried to make a column of balloons, but I always seem to leave gaps where the bunches cross each other? Am I overinflating the balloons? how to create a "hot air balloon" shape with regular balloons to decorate a wall? How do I make a balloon archway with spiraling colors? I have seen top table decorations, with tulle and small balloons draped in swags. How do they get the decoration to fix to the table cloth? 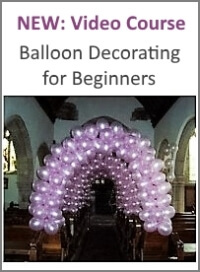 Is there anywhere I can get a book or ebook on balloon fundamentals and pricing? Thanks. My son's birthday is going to be at a pavilion which have four wide-concrete-columns, I want to cover them with balloons, how do I do that? What kind of string do I use to make a balloon arch? What's the cause for my balloons to deflate? How much weight will a 12" balloon hold? How many balloons for a balloon column? I would like to make balloon columns. What is the average size for that and how many balloons would I need? Thank you. Hi, I was wondering what I can use to delete writing with a 'posca' marker, as I've made a mistake on a foil balloon. Please help asap. Can you make a spiral effect arch without the frame? I would like the letters to be secure and attached in two places per letter and able to slide along the monofilament for final positioning. What are the ways to put letters on balloons for an alphabet theme that looks classy and nice, not just writing it? Where can I get an electrical balloon inflator? How does the balloon arch stay arch shaped? Why is my air filled arch made with aluminium rod sagging in the middle? The arch is not arch shaped. It is swinging down in the middle. How do I make a frame for a star and heart wall arrangment? I'd like to know how to make a baby from balloons as a centerpiece for a babyshower. What is the safest way to write on a balloon? My son wants to ask a girl to Homecoming and wants to write a letter on each of the balloons. My balloon pump inflates the balloon perfectly, but when I shut the valve off, the balloon does automatically deflate. What can i do to correct this? What is the smallest size of balloons available for air fill? Where can I get a picture printed on to a balloon? What can I use to write on latex balloons? How do I make a balloon archway? I am trying to make an archway for my daughters birthday party, buy haven't a clue how. Please help. Any tips on how to create a balloon star arch out of pvc pipe for a school dance? I want to create a base and then wrap balloons around it. How to stop clear balloons from oxidizing when outside? I make gift in a balloon & several arches, but when outside in the heat, balloon turns white? what can I use to prevent this from happening? How can I get directions to make a bride and groom out of balloons? I would like to write on a foil balloon but unsure of what kind of pen to use and where could I purchase one?? How would I turn balloon arch into heart shape? I need to do a heart shape from an arch. How do you attach a banner to a balloon arch? How do you make a heart using a lot of round balloons? Answer: Please look at our explanation how to make a heart shaped balloon decoration . If you prefer to contact us personally, please feel free to fill in our contact form.